As the founder of I.E.A. and a contributing author of “Operation Multiplication,” Dr. Billie Hanks, Jr. is regarded as an international authority on the subject of retaining and discipling new church members on a one-to-one basis. Dr. Hanks has participated in five national and international congresses on evangelism and is currently leading “Operation Multiplication” conferences throughout the world. He is a graduate of Baylor University in Waco, Texas and Southwestern Baptist Theological Seminary in Fort Worth, Texas. In 1972, he founded West Texas Ranch for Christ near Sweetwater, Texas. Later, he served as minister at large with the Billy Graham Evangelistic Association. His Christian folk ballad, Lonely Voices , was recently televised nationally and is a religious best-seller. “Operation Multiplication” is an international movement that is enjoying God's blessings in participating churches of all sizes. Its equipping emphasis is based on 2 Timothy 2:2 and focuses on prayer, Christian friendship, and a highly effective lifestyle of evangelistic multiplication. Our board is grateful to God for this cooperative evangelistic effort. Participating seminaries, churches from 40 denominations, and outstanding missions organizations are all working together toward a common goal. “Operation Multiplication's” one-to-one discipleship training process is the servant of all Christians who are striving to carry out the Great Commission! After reviewing the basic strategy, we believe you will agree that spiritual multiplication is an important but neglected Biblical principle that needs to be rediscovered and maintained in church life everywhere! The global mission of “Operation Multiplication” is to reignite the dynamic force of evangelistic multiplication through equipping relationships. As this takes place in churches, a wide range of positive results are being observed. In one mega church, the attrition rate has fallen from 53% to 3% in only two years. In hundreds of other pilot churches, new believers are excitedly growing and sharing their faith naturally! The following information will present the “Operation Multiplication” strategy. We hope you will order and review the non-profit Pastor's Orientation Pack or a layperson¹s Complete Discipler's Pack . After you prayerfully study these materials, you can share the vision with your church leadership. As you prepare to implement “Operation Multiplication,” the National Coordination Office will look forward to assisting you. Please call 1-800-779-7570 to talk with a ministry consultant. Our prayers will be with you as you experience this exciting New Testament ministry. It opens the church's “front door” through lifestyle evangelism and closes the church's “back door” through equipping relationships. We feel both of these emphases are equally important and pray your entire area will be blessed as you carry out the Great Commission! The Scripture has a great deal to say about Christian mentorship, once we understand that spiritual training is primarily a ministry of example. Paul once said, “ Follow my example, as I follow the example of Christ. ” (I Corinthians 11:1) This clear principle echoed Jesus' earlier words to His disciples when He said, “ Follow Me and I will make you fishers of men. ” (Matthew 4:19) The unmistakable emphasis of both invitations was to learn by observation. This principle, so common to life, was the cornerstone of early Christian education, because spiritual instruction took place in an environment where relationships were the primary means of gaining personal growth. The classic phrase, “More things are caught than will ever be taught” defines one important aspect of effective follow-up. Although many aspects of spiritual growth can be transmitted through a corpus of Christian literature, personality, enthusiasm, laughter, and the twinkle in one's eye cannot. These experiential aspects of communication are also indispensable components of a successful equipping and new member assimilation ministry. While the cognitive aspects of discipleship are numerous, there is an intangible quality of spiritual life which only flows through the friendship itself. Why is Christian mentorship the critical link for successful evangelism? Dr. Herschel Hobbs wisely said, “The work of evangelism is never complete until the one evangelized becomes an evangelizer.” A breakdown in the initial follow-up or foundational equipping process can short-circuit the tremendous potential of this cycle of evangelistic multiplication. Consider compounding interest, the reproductive cycles of nature, or the world's biological population explosion. Soon it will be clear why multiplication is God's primary method for replenishing the earth. For the church, spiritual multiplication is the essential key for fulfilling Christ's missionary mandate (Matthew 28:19-20). Through just one committed new believer who is growing consistently, sharing his faith naturally, and personally training others to do the same, the entire world can eventually receive the good news of Jesus Christ! 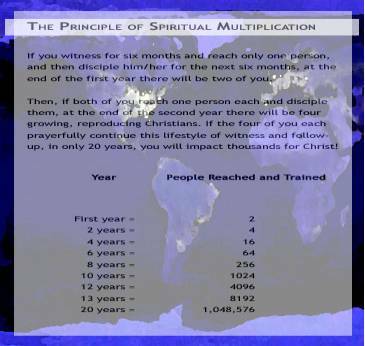 (Please see The Principle of Spiritual Multiplication graphic below.) This amazing process of spiritual multiplication is so personal, enjoyable, and effective, that any church in the world can do it. It simply requires the vision and commitment to train Disciplers to personally work with every new believer and new member who joins your church. Through these Christ-centered friendships, those who are trained grow spiritually, and learn both “why” and “how” to disciple others. This cycle of follow-up, spiritual growth, and lifestyle evangelism is the practical expression of 2 Timothy 2:2, which Billy Graham refers to as a “one-to-one” ministry. You may be thinking, if the world can be evangelized in one generation through spiritual multiplication, why hasn't it already happened? Personal evangelism will not produce multiplication in isolation from effective follow-up and mentorship training. In other words, personal witnessing and personal follow-up must be seen as interlocking parts of a comprehensive and intentional discipling process. Ultimately, through this New Testament approach to evangelism, lifestyle witnessing can become as natural as praying. Acts 1:8 is not merely a ministry for a few believers who are called by God to pastor or teach; it is to be the ministry of the entire church. Experience has taught us that Christian friendship and mentorship should start as soon as possible after a new believer makes the decision to receive Christ. In one major study, a church discovered that 90 percent of its new members successfully completed their several month follow-up and mentoring process. The reason for this success was attributed to the fact that every new member was personally assigned to a trained Discipler within 72 hours after making their spiritual decision. In today's nomenclature, personal follow-up and one-to-one discipleship training are at the very heart of effective new member assimilation. Each Christ-centered friendship functions like a tutor pointing the way to the many other equipping and educational ministries of the church. As we restore relational ministry to its early place of prominence, we can begin earnestly praying for a new generation of equipped lifestyle witnesses. Luke 10:2 says, “The harvest is plentiful, but the workers are few. Ask the Lord of the harvest, therefore, to send out workers into His harvest field.” Let's move ahead in faith, trusting God to answer our prayers and ask Him to raise up laborers for His harvest in each of His churches around the world! If you would like to review the “Operation Multiplication” materials, simply visit IEA's Online Store . We suggest churches start by ordering the Pastor's Orientation Pack. Individuals can start by ordering the Complete Discipler's Pack. “Operation Multiplication” is now available in English, Spanish, Romanian, Russian, Ukrainian, and Portuguese. Please contact Casa Bautista to order Spanish materials.